Former Uber CEO Travis Kalanick is becoming the CEO of City Storage Systems. The company takes disused spaces like car parks and abandoned shopping malls and helps businesses make use of them. The company has projects to create kitchens for food delivery and also warehouse space for online retail companies. Uber founder Travis Kalanick announced on Tuesday that he had agreed to become the CEO of a small, relatively new US startup which aims to take abandoned and disused spaces and turn them into kitchens and retail locations. Recode reports that City Storage Systems is working on multiple projects to transform underused spaces. It said that the company takes spaces such as parking lots and abandoned industrial units, and turns them into spaces that could work as food delivery kitchens or warehouse space for online retail companies. The company isn’t anywhere near as big as Uber. In fact, Kalanick said it’s currently a 15-person team. The parent company doesn’t have a website, either. If you Google its name, the first business you find is an Indian manufacturer of storage racks. But one part of the company does have a website that explains how it works. CloudKitchens is the company’s project to help restaurants build kitchens dedicated to food delivery. It’s the same concept as UK-headquartered food delivery company Deliveroo’s Deliveroo Editions project, which uses temporary structures in car parks to house small kitchens that make delivery-only food. 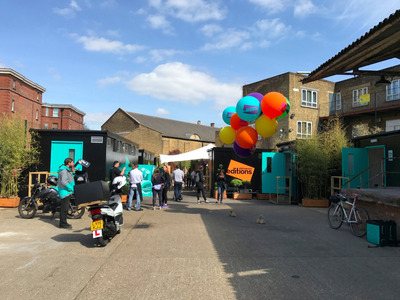 Business Insider/James CookA Deliveroo Editions site in London. The thinking behind CloudKitchens is that restaurants can use it to cheaply add food delivery to their business, or to scale up that side of the company away from their in-house kitchens. Kalanick joining City Storage Systems means he’ll now be partners with Uber, the company he founded and grew. Uber’s new CEO, Dara Khosrowshahi, said on Twitter on Tuesday that its food delivery division UberEATS had partnered with CloudKitchens. The way that Kalanick ended up at City Storage Systems is pretty bizarre. On March 7, Kalanick announced that he was launching a new venture capital fund that would invest in job creation and companies that worked in real estate and e-commerce. On Tuesday, Kalanick announced that he was investing $US150 million (£106 million) into City Storage Systems and had acquired a controlling stake in it. In the same statement, he said he would become the startup’s CEO. Kalanick left Uber in June following months of controversy over alleged sexism, a looming legal fight with Google’s self-driving car division Waymo, and an explosive blog post by former employee Susan Fowler in which she described a dysfunctional workplace culture.